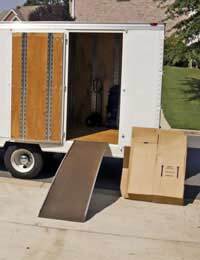 If you’ve decided to choose a professional removal company over doing-it-yourself there are a number of things you’ll need to consider. Price is going to be one of the major determining factors but you should also be looking at their reputation, insurance cover and, if possible, if they can provide you with any written references. Here are some of the things you need to think about before choosing one company over another. Most people will usually ring up a company from their local Yellow Pages or Thomsons Directory but many of the more established removal firms will also have an internet presence these days so it’s worthwhile ‘googling’ too. Also, if you’re choosing a local company over a national one, don’t just restrict yourself to the locality you’re moving from. It’s always worth checking out companies in the area you’re moving to as well as you might be surprised how much of a price variation there can be. You should get quotes from at least 3 removal firms but it’s important not to simply be persuaded by price as they won’t be able to give you an accurate quote over the phone and they might be able to offer you a special discount or their insurance cover might be better than a competitor’s or they may be able to offer additional services so, although one company might appear a little more expensive on paper, their overall ‘package’ might turn out to be far cheaper and more suitable. Most reputable companies will send out a representative to visit your home in order to be able to give you an accurate quote. The cost will be based upon the number of hours they will expect the job to take, plus taking into account additional services you may wish to have them provide such as providing you with their own extra large containers or perhaps you’re looking for them to help with taking up the carpet, for example. If you’re looking for them to help you with the packing, you’ll need to ask them how much extra this will cost. Whatever services you ask them to provide, be sure you get an accurate quotation based around an agreement of their exact obligation to you. They might, for example, charge you extra for moving very large objects such as a piano or a snooker table. You should also find out the type of insurance policy they have in the event that any of your items is lost or damaged during the move and if they offer any discounts if you choose to book a slot that’s outside their peak operating times. You should also check that they are covered by insurance should one of the removal men perhaps injure themselves in your home whilst moving stuff as you won’t want to be liable for that. Also ask how many people will be employed to help the driver with the move and whether they expect you to do anything on the day of the move. The earlier you book, the cheaper it will usually be. Sometimes this isn’t always possible as you may be waiting on the people who live in the house you’re moving to move out and they may be held up. However, the later you leave it, the likelier the cost will rise as if they think that you might struggle to find another removal company at short notice, they may bump up their rates. Although you may have children and wish to move during the school holidays, be prepared to pay more for the privilege and Fridays can be expensive too as people tend to make a long weekend out of a house move to give them more time to get settled into their new place. You’ll want to ensure that you are not employing the services of a bunch of cowboys and, fortunately, there are a couple of ways you can get that peace of mind. Firstly, if you choose a nationally recognised company, they’re more likely to have an established grievance and complaints procedure in place that you can turn to. Also, if reliability is key, a larger firm will ensure that your removal will still take place on any given date, even if an employee who might have been originally designated for the job has to come off work ill at short notice. Obviously, for these additional services, you’ll probably have to pay more but it may well be worth it for your peace of mind. Then, there is also The British Association of Removers (BAR) and it’s worth checking that they are a member of this regulatory body. It might not mean that everything will run completely smoothly, or that nothing will be broken but membership does guarantee that the company meets certain professional standards. Finally, most reputable companies will have no objection to you asking for written references from previous satisfied customers if you want extra reassurance. By taking all the above into consideration, you’re more likely to find a professional removal company to move your belongings from one house to another with the minimum of fuss and, even if you don’t take the cheapest option, it’s important that you find the best price to give you the peace of mind you’ll need during this often stressful time.